Several years ago my brother acquired a cordless band saw/pipe cutter. The batteries died and although I do not use it very often it would be nice to have it in working condition. A replacement battery is $61, rebuilding the batteries would cost $39. The alternative is to build a power supply. I did some research online and with the help of people on the badcaps.net forum I built one. 1 - transformer 120v in 16v out, I do not have the amp ratings for it. 1 - 10,000uf 35v or higher electrolytic capacitor. You can use 3 - 3300uf 35v caps in parallel or 2 - 4700uf to 5000uf 35v caps in parallel. misc wire that can handle 20amps. 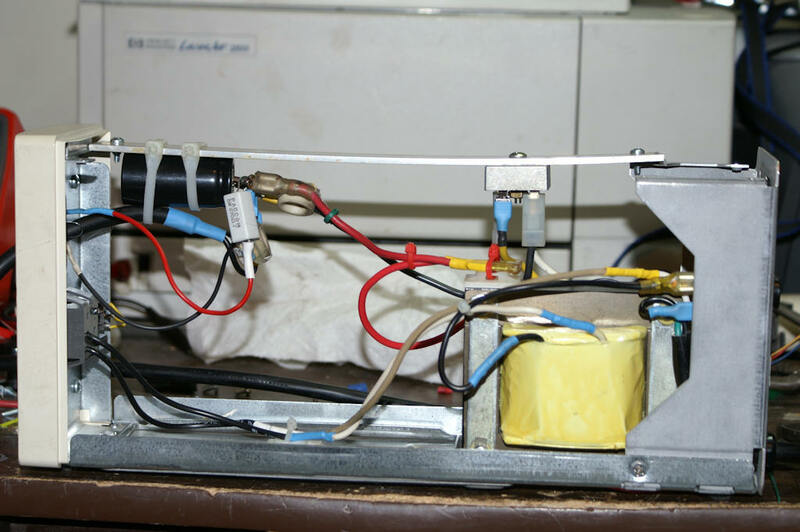 I wired a standard 10 amp power cord to the input of the transformer and plugged the yellow and white wires directly in to the rectifier. I ran 2 wires from the dc output to the capacitor (making sure to keep the polarity correct). From the capacitor I ran the wire through another 10 amp cord to the contacts inside the battery cartridge (after removing the dead batteries). This way If needed I can still use batteries if I want to. I mounted everything temporarily to a board. 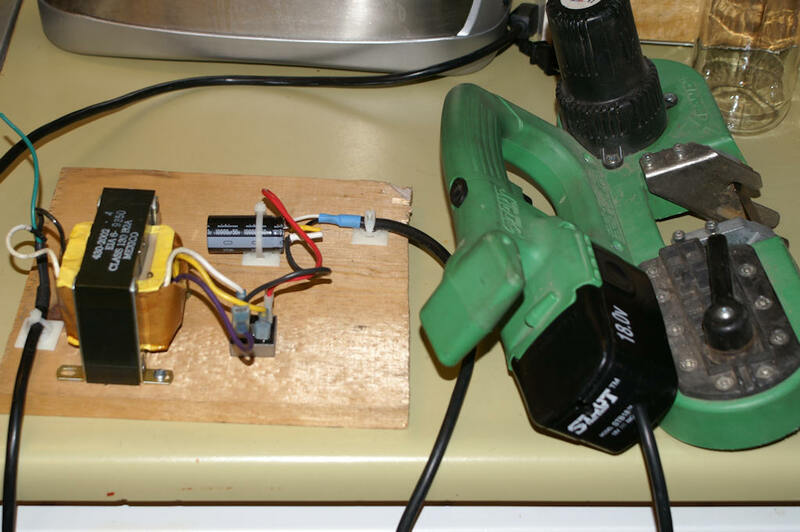 With the band saw not running, voltage from the output is 22vdc, while it is running the voltage reads 18vdc. I will mount the power supply in a box and add a switch, light, and fuses. At this time I am not sure what the maximum amperage draw is, I will have to check that and install the appropriate fuses. I did not install the bleeder resistor at this time, and I'm not really sure if one is needed. It would be installed across the leads on the capacitor if I do. The capacitor and rectifier cost $20, I could have gotten them cheaper if I ordered them on line, but did not want to wait for them. I could not find a box to mount it in, so I re-used the UPS case. I was able to re-use the original circuit breaker, and switch. I also added a 20 amp fuse on the DC side, and an LED on the front of the case. The rectifier is mounted to a piece of aluminum (with heat sink compound) that I had to install to properly brace the front and rear panels, since the original circuit board was used for that. The LED is connected to a 270 ohm 5 watt resistor. 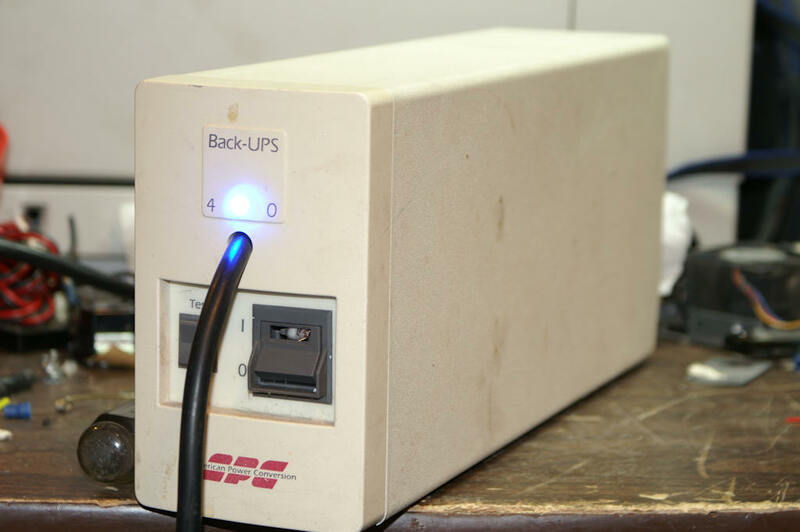 It bleeds the capacitor down to a safe voltage in about 25 seconds when power is turned off. The LED will stay dimly lit for some time after that. Pressing the switch on the band saw will make the LED go out if power is off. The LED does NOT dim when the band saw is in use. I may mount a fan in it at a later time if I find there are any heat issues. I doubt there will be as I will not be using it for continuous duty. Thanks for the idea & tips! I was able to build an almost identical model using a standard doorbell transformer (typically 120=>16v). Working on housing it all inside a dead battery casing. This was a perfect way to upgrade the hand-me-down tools I got for Christmas. Lex. You will not have enough heat disepation if you try to do that. Also. The va of a doorbell transformer is way too low to give enough amps for proper operation. Curiosity Heat Shield Descent Stabilized.